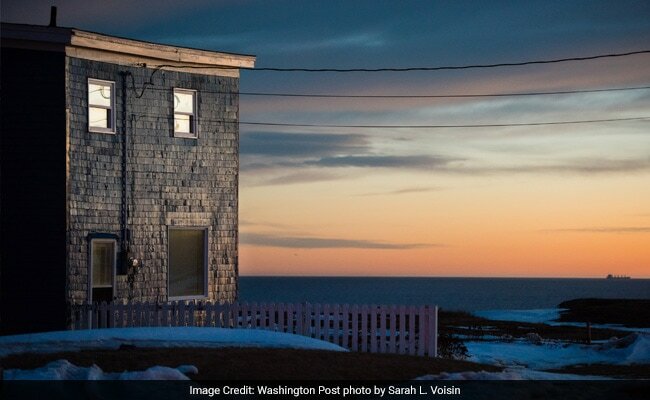 Cape Breton Island, Canada: The first sign of what Rob Calabrese would come to think of as America's unmooring began last year, just after Donald Trump won his first presidential primary and Calabrese published a $28 website that he'd designed in 30 minutes. "Hi Americans!" it began, and what followed was a sales pitch for an island where Muslims could "roam freely," and where the only walls were those "holding up the roofs" of "extremely affordable houses." "Let's get the word out!" Calabrese wrote, adding a photo of an empty coastline along the Atlantic Ocean. "Move to Cape Breton if Donald Trump Wins!" It was meant as a joke - but seven hours after Calabrese linked the site to the Facebook page of the pop radio station where he works as a DJ, in came an email from America. "Not sure if this is real but I'll bite." And then another: "It pains me to think of leaving, but this country is beyond repair." And then more. Within 24 hours, there were 80 messages. Within a week, there were 2,000, and many used the same words: "nervous" and "terrified" and "help." "The United States is losing its mind," one person wrote. "So ashamed of half of my country I could curl up and cry," wrote another. The emails kept coming, so many that soon the island's tourism association brought on four seasonal workers to help respond to the inquiries, which were arriving from every state and hundreds of towns, until it seemed to Calabrese that America was filled with people who wanted to get away. "Look at this one," he said one day recently, scrolling through a spreadsheet where the inquiries were organized and stopping on No. 2,121. "I am a former U.S. Marine who did two tours to Iraq. And I want out of here." "Beyond astonished," Calabrese said, scrolling through more. There were emails from a molecular biologist, a University of Oregon professor, a granite construction worker, a contractor for the Centers for Disease Control and Prevention, a woman who said her home town was "Unfortunately, Alabama." There were declarations and confessions about incomes, sexual orientations, goals for their children. Several included resumes. "I am so sick of what has happened to my beautiful country," one letter began. "I desperately want to move my daughters to the safety and sanity of Canada," email No. 3,248 read. "It doesn't even really matter if Donald Trump wins. He has exposed the awful attitude that plagues the US." "This is no longer the America I have loved for all my life," email No. 3,310 read. "I am a hardworking man and could contribute much to any country that gives me a chance." It was somewhere around email 4,230 that Trump was elected president of the United States, and just before his inauguration came email No. 4,635. "Looking to immigrate to Cape Breton area from Colorado," it began. "I am a skilled paralegal and my wife is an attorney." Calabrese read it, wondered briefly about the people who sent it, and waited for the next one to come in. "What do people see on the horizon to be this afraid?" he said. The email was written by Jimmy Gantenbein and Cathleen McEwen from their living room sofa in Loveland, a town 50 miles north of Denver. A month later, furniture from that living room had been stuffed into the garage. Paint buckets lined the hallway. They'd been in touch with a real estate agent. Soon they planned to have their home on the market. "Can you hand me a nail?" Cathleen, 61, asked as she fixed up the bedroom. "Here you go, Cat," Jimmy, 54, said. They'd bought this home at the start of their marriage - the second for Jimmy, the third for Cathleen - and 17 years later they knew the place nearly as well as they knew each other. They had a view of the Rocky Mountains from the bedroom. Afternoon sunlight warmed the carpet where their old poodle liked to curl up. Two right turns and a left took them to the local Safeway. "We're going to love it here," Cathleen remembered saying on one of their first spring nights, after a neighbor's 50th birthday party ended with outdoor cartwheels. They lived on a cul-de-sac with two other homes, and Cathleen spent a few years on the city council. They made friends with Democrats and Republicans. When Cathleen's son, an Army reservist, returned from Iraq in 2005, 150 people showed up at the local veterans' hall for barbecue and beer. There was a short period when they rented out the home and moved to a more commercial part of the city, hoping to improve their business. But they returned as soon as they could, and even as they aged, and faced some health problems, and their business slowed, this place remained the closest thing to a constant in their lives. And then came the arrival into their settled world of Donald Trump. He was on TV so often that Jimmy and Cathleen created a no-Trump rule after 9 p.m. He was in their town, holding a rally 10 miles from their home that drew an overflow crowd. He was in their neighborhood, his name popping up on yard signs all around them. During primary season, it felt as if he'd arrived at their own front yard, when their neighbor saw them in the driveway, walked over, and said he was supporting Trump. We're going with Bernie, Jimmy and Cathleen recalled saying, and though the conversation was brief and cordial, they hadn't talked to their neighbor since. "We feel out of sync with everybody," Cathleen was saying now. Just that morning, signing onto Facebook, there was a post written by her friend Pam, somebody she'd known for 13 years, telling Muslims to "grow a pair" and "defend the country they immigrated to and assimilate!" She thought for a few minutes about what to do and then punched out a response, telling Pam to "put the same mental energy" into researching the Muslim faith "that you put into your diatribe." Then came the back-and-forth among other people, 19 comments, no minds changing. "People are in a frenzy to out-anger," Cathleen said, and she read the comments aloud to Jimmy. She'd had 400 Facebook friends before Trump. Now she had 288. "It's just that Trump mentality," Jimmy said. "We can't have a conversation with anybody," Cathleen said. "We try to engage, but it's usually . . . "
"Yeah," Cathleen said. "I haven't been very good at peacemaking lately. It's making me a worse person. You know, if you can't rise above it. But I can't totally resist." She went on: "I don't know what to do constructively. It's a crisis of purpose." And so, they were thinking of leaving. It's not that they had never thought of moving - they'd talked before about finding a cheaper place as they aged - but when Trump came along, that's what pushed them. To where, though? Just move closer to your grandchildren, Cathleen's son, an accountant in Tulsa, Oklahoma, said. Just don't leave the country, Cathleen's daughter, a doctor in Toledo, Ohio, remembered telling them. "Don't give up so quickly. Now more than ever, good people need to fight for what matters." But Jimmy and Cathleen didn't see it as giving up. Instead, they felt America becoming so off-kilter, so "angry" and "bigoted" and "regressive," that they thought maybe the moment required an absolute break. "I don't recognize the country I was born in," Cathleen said. "I was born into a narrow-minded, anti-intellectual country. It took me 61 years and one election to figure it out." So now, they also had a "Relocation" folder on their computer filled with information about Panama and Belize and Costa Rica and Canada. They'd bookmarked the Cape Breton website and set up Web alerts for real estate listings on the island. They'd talked to an immigration lawyer in Canada. "I'm so glad they aren't around to see this," Jimmy said, in the living room now, where there were two folded funeral flags honoring their veteran fathers. "It just keeps getting worse," said Cathleen, who keeps a framed copy of the Gettysburg Address on the basement office wall. So many decisions to make. Would they sell off their stuff? Would they give up their citizenship? Would they be able to repair damaged relationships with their children and grandchildren? And if they made it to Cape Breton, would they feel regret? They knew it was cold. They knew homes were cheap. But they'd never been there. "It's risky to stay and risky to go," Cathleen said, and now they were back in the bedroom, hammering in new baseboards and fastening new light switch covers. "Maybe," she said, "the pragmatist wins out." "Maybe," he said, "we rent for a while and figure things out." Cathleen put down the screwdriver and sat on the carpet. "We're in a quandary," he said. Their dog was sleeping. Soon, their real estate agent would be calling. Homes sold fast in Loveland. Eight weeks and there'd be a "for sale" out front. Jeff Mills, foreground, and Willie Covey, of Louisbourg, ice-fish on the Mira River. Maybe Cape Breton, and maybe the house whose listing Valarie Sampson, a real estate agent who'd heard from a handful of Americans, was looking at now. Right on the ocean. A renovated farmhouse. One hundred forty-four acres of land. $220,000 Canadian, or $164,000 U.S. On the market for more than three years. Winter viewings, the listing said, "require snowshoes." 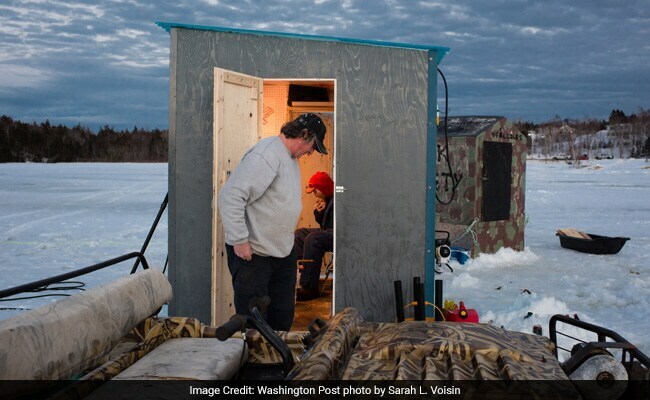 "It's a beautiful home if you're looking to escape," said Sampson, climbing into her SUV and steering through an island that people don't come to anymore but instead have been choosing to leave. Once rich in coal, mining had dried up and no industry yet had replaced it. Every year, another 1,000 people were either dying or taking off for larger cities such as Toronto or Halifax. Budgets were shrinking. Ten schools had closed in the last year. The island's unemployment rate was 15.5 percent. The population was down to 130,000, and that left Cape Breton with hundreds of abandoned homes awaiting demolition and several hundred more for sale. Navigating streets narrowed by high snow, Sampson turned into a neighborhood of simple vinyl-sided homes near the shuttered coal mines. "This one has been on for months," she said. A few minutes later: "$149,000 for this one. We haven't had one viewing." Sampson knows that summers here feel different. The tourists arrive. The lobster and pizza restaurants reopen. The lakes fill with sailboats. "The geography is second to none," she said. "A one-hour drive in any direction will take you to the beach." But for four or five months of the year, this is a place with short days, frigid temperatures and icy sidewalks, where people play backyard hockey or gather in little bars and doughnut shops. As Sampson returned to the office, the only activity in Sydney, the island's largest town, seemed to be a meeting of community leaders who were talking about how to save the island. "We don't get people, we're going to die," Rankin MacSween, head of a community development group, was saying. "These are huge losses against an already small population," a lawyer said. "It doesn't take much math to realize how much time is left." People passed around a five-page research paper that said the island needed to attract 2,000 people annually to remain viable. There'd been decades of failed attempts to rebuild. The island had one new thing going for it - the website. More people knew about Cape Breton now. "We're receiving thousands of emails," one person said at the meeting. But that wasn't the same as thousands of people moving there. Canada had strict immigration laws. People couldn't just come because they wanted to. Applicants were scored based on age and skills and their ability to help the economy. Anybody who emailed Cape Breton was told they still had to apply through Canada's immigration agency. They were sent a link to begin a process that could take more than a year. So maybe some Americans would arrive someday, but they hadn't yet. As the responses rolled in, Calabrese had revised the site's text to make it less political - and less directed at Americans specifically. "The truth is," Calabrese had written, "we welcome all, no matter the ideology. Join us!" "We need to be thinking about this," the lawyer said as the meeting was winding down. "What kind of person would come here?" One answer to that question could be found just past the meeting hall, in a house that had been stripped of wire and abandoned for a year and now had a family of seven inside, all of them from Syria. School had just ended. The television was on. The kids were squeezed on a couch. "What are you drawing?" the father, Ahmad Hamadi, 35, asked one of his sons, Mohamad, who is 10. "It's a Pokemon," Mohamad said. He held up the drawing for a father who eight months after arriving was still sorting through what it meant to have left a country he loved. "It looks good," said Ahmad, and then he turned back to the television. These were the people moving to Cape Breton: refugees from the Syrian war who not only left their country but had to flee it. Fifty-four had come so far, and Ahmad and his family were among the most recent. After escaping Syria and spending several years in Lebanon, they had ended up here because of the sponsorship of a church group waiting for them on an island they'd never heard of. They'd been traveling for 48 hours: Beirut to Cairo to Toronto to Cape Breton. They landed at 1:30 a.m. They were shuttled into a van, and when the sun came up Ahmad found himself in a house stocked with food and furniture and toys, all of it his and none of it familiar. Compared with where he had come from, it was quiet outside. The electricity worked. The children went to school. Ahmad pinned a small Canadian flag to the front door, and every day he walked out was another chance to adapt to a new place. He applied for positions at Value Village and a building supply company, where an interpreter helped him with the interviews, but he didn't land either. He asked about an entry spot at a Lebanese restaurant, but the owner didn't want somebody without experience. Months passed with nothing. He got a driver's license. He lifted weights at the YMCA to burn stress. He thought about applying for a late shift at McDonald's, but one of the leaders from the church committee that sponsored him said he should instead ramp up his English and become more employable. So twice-a-week government-funded English classes became four-a-week, and for Ahmad the sessions became his best excuse to leave the house: a two-mile drive across town to a community center classroom, where the names of Canada's 10 provinces and three territories were written on the chalkboard. "How are you?" the teacher, Susan Burchell, asked as Ahmad walked in. "Bored?" she asked. She addressed the grammar instead of the sentiment. "It's good you didn't say boring," she said, and when he didn't say anything, she asked, "What do you want to do today?" "Nothing," he said, shrugging. "Learning?" "What did you do last week? Talk to me about it." "Shopping," he said. "I went to Walmart. We went to Tim Hortons. And we went to my friend." "Do I know this friend?" "An old man. From Lebanon." Before the war, in a town outside of Damascus, Ahmad had owned a small department store. He'd lived on the same street with his parents and three siblings. He met friends for late-night shawarma and chicken at restaurants. He had fled four years ago, and now his family was scattered across three continents. Among his five closest friends, he figured four were dead. The restaurants were just as likely rubble, something he thought of when he opened up Facebook and saw videos of charred and ruined street blocks. Had he known those places? Could he recognize them now? He'd built a home for his family in 2010, ceramic tiles in the kitchen and the apricot trees out front. Was that home, too, part of the rubble? He'd heard it might be. "One day I had a car, a house, a business, a life," Ahmad said. "The second day I lost it all." Ahmad had the best fortune of almost anybody he knew, and yet because of the changed fortunes of a country he loved, he was here, looking out at a yard with five-foot snowdrifts and a horizon with an early-setting Canadian sun. He sat down on a chair and rubbed his aching back. "Can you grab me some Advil?" he asked his daughter, Aya. She reached into a cabinet and handed him a pill. Ahmad's hair was greasy, and stubble covered his neck and face. "A fish out of water, they die," he said as his wife prepared lunch in the kitchen. The smell of hot oil filled the air. Ahmad swallowed the pill, drank some tea, and waited for the ache to go away. "Cat, did you see that!" Cathleen and Jimmy were driving back at dusk from a window-screen repair shop when a big white owl soared in front of their car, and soon they were at home talking about the owl that used to live in their front yard, the elk that would roam out back, and how this has always been their favorite time of year. Every spring on the cul-de-sac, they'd crack the windows open, hear birds in the spruce tree, see the crocuses and gray hyacinths sprout from the fresh mulch in front of their house. Sundown came later. They'd barbecue. They'd see the neighbors more. And sometimes, they'd take off for road trips in their SUV: heading east across the plains and into the Ozarks, or maybe west, over the mountains and past the Continental Divide, finding lakes for fishing and stopping at fruit stands and sleeping in whatever motel they could find. "So long as it wasn't flea-ridden," Jimmy said. "We didn't have any plan," Cathleen said. "We'd just kind of wing it." "Remember the Black Canyons?" Jimmy said. "Remember those cliffs?" Cathleen said. "The Million Dollar Highway?" Jimmy said. Their home inspector. In two weeks, the house would be on the market, and as soon as it sold they'd be on their way - first to visit their children and, after that, they'd have to see. Maybe a drive through America would remind them of things they were forgetting. The inspector shook their hands and walked in. He carried a measuring tape, a notebook, and tools in a zippered pouch. He checked on the things that would be used by whoever lived there next - the furnace, the hot water heater, the electrical boxes - and moved through the rooms that now looked as though nobody had lived there before. No more family photos. No more artwork. Almost two decades of things boxed away. "So," he asked, "where are you guys moving to?" There'd been a run of 60-degree days in Loveland, and meanwhile in Cape Breton, the temperatures were near freezing, forecasters were saying another eight to 11 inches of snow were on the way, and the emails were still arriving, a couple every day. "I can no longer live here, nor sleep with this evil man as our leader," one person wrote. "History repeats itself and I can feel a repeat of the Third Reich," another wrote. "I am heartbroken seeing our America be torn apart . . . by one, out-of-touch billionaire," another wrote. "Please help me," another wrote. Calabrese read every word, and as he waited for the snow to arrive, and the Americans to arrive, and email No. 4780 to arrive, he thought about how fortunate he was to live in a place where he wants to be.